Double drapery rod installation, priced each. Two way draw. Superfine traverse rods. This double drapery rods set includes 2 two way draw traverse rods for a combination drapery and curtain window treatment. Superfine Traverse Rods include drop in brackets, supports and cord tension pulley for installation. Made from heavy guage steel with a baked enamel finish. Exclusive Kirlon on all sliding surfaces. Push in brackets and extension plates are available as an option. Only the finest pulley sets are used. Strong and durable with a slide gate for easy removal of extra slides. Long wearing, stretch resistant polyester cord and continuous lacing for use at either end or to convert to a one way draw. Two way draw, extends from 86 to 150 inches. Metro Track system wall mount bracket with a 3" and 6" projection. Use one bracket for every three to four feet for best results. Traverse rod bracket 3 inch projection. Use with C-rings to allow curtains to pass over the support bracket. Some colors are more than base price. Stock Colors: Black, Antique Gold, Rust. Kirsch superfine traverse rods can be used as wall mount or ceiling mount curtain rods. Two Way Draw, includes 46 slides and 3 center supports and end brackets. Extra long curtain rods. Superfine drapery rods and hardware for any window in your home. See how to install drapery rods in the support section. Sizes over 94 inches will have an oversize freight charge added. Superfine Traverse Rods include drop in brackets, supports and cord tension pulley for installation. Made from heavy gage steel with a baked enamel finish. Exclusive Kirlon on all sliding surfaces. Push in brackets and extension plates are available as an option. Only the finest pulley sets are used. Strong and durable with a slide gate for easy removal of extra slides. Long wearing, stretch resistant polyester cord and continuous lacing for use at either end or to convert to a one way draw. Two way draw, extends from 100 to 180 inches. This bamboo 2" curtain rod is natural bamboo, Since these are natural, no two are alike. Natural pits, discoloration and pole curves are enhancements to the bamboo design and are not considered defects. 1 3/8 inch Kirsch designer metal telescoping traverse rod poles comes in seven new colors with plain slides. Sizes to fit windows from 38 inches to 180 inches wide. Each set includes plugs for finial and brackets for mounting. Plain slides option with twenty style finial options to complete your decor. Double rod curtain rods by Kirsch. Clearance 2 inches. Includes brackets and 2 supports. White finish. Double drapery rods, Continental 2 1/2" in front, standard curtain rod in back. 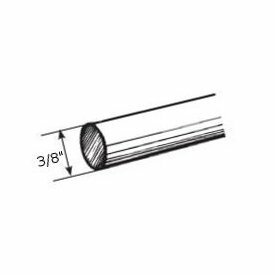 Three inch Select Wood Rods for Curtains are available in smooth and reeded styles in ten beautiful finishes and unfinished. If your window requires extra long and extra wide draperies, this wooden curtain rod pole will give your treatment the grand proportion it deserves. You have four wooden drapery rod bracket styles, ten wood finials for curtain rods, plus more in resin, for your selection. Also, select from two end caps and two ring styles where needed. Wood for the Select Wood Collection is chosen from fine furniture grade stock to ensure maximum performance. One piece sizes up to 192 inches long.